The Isle of Wight is one of Britain’s most popular holiday destinations and it’s easy to see why with clean air, award winning beaches, and a warm welcome extended to all. With an almost tropical climate the island has become a centre for outdoor events, sports and hobbies. Several world famous events take place here each year and include Cowes Week, The Isle of Wight Festival and the award winning Bestival. Over half of the island has been designated an area of outstanding natural beauty and sports over 500 miles of well maintained paths with which to explore, making the Isle of Wight a top walking holiday destination. The island has a rich history which can be discovered with visits to places such as Carisbrooke Castle and Brading's Roman Villa, interestingly the Isle of Wight was once classed as an independent kingdom back in the 15th century. Although a stretch of water seperates us from the U.K. mainland the island is still easily accessible. Travelling from Southsea by hovercraft you can be on the island in just 10 minutes. Several foot passenger and car ferry services also operate across the Solent with journey times of between 20 minutes and 1 hour. 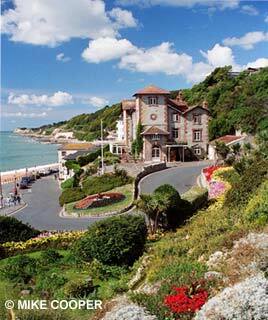 Let us help you plan your Isle of Wight holiday. Our island boasts a wide variety of accommodation for visitors including Isle of Wight hotels, Bed and Breakfasts, Holiday Parks and Camping and Caravan accommodation. The Isle of Wight has something to suit all tastes and budgets. With over 60 Isle of Wight Attractions and a host of activities to choose from you will be spoilt for choice on how to spend your holiday on the island. Choose from fantastic activities, family fun, live entertainment, history and heritage, churches, castles and museums, stately homes, extreme sports and miles of unspoilt beaches and countryside! Did you search for Isle of White?. Don't worry this is a common mistake. The correct spelling is 'Wight' rather than 'White' or 'Whight'. Nobody really knows how the island came to be known as the Isle of Wight. During Roman times the island was known as 'Vectis'. Later in the Anglo-Saxon Chronicle the island is reffered to as Wihte ealond, Wihtland or Wiht, variations of these spellings emerged in the Middle Ages Wicht, Wict, Whyht, Wyght and Wight. Although we are unsure of how the name was derived it has been suggested that Wight could mean 'what has been raised'. They say images speak a thousand words. Have a look at Isle of Wight Landscape Photography for a taste of the beauty of the Isle of Wight.